Kaci Cronkhite has written a story of full immersion. Her recently published book, Finding Pax, takes the reader on a seven year journey connecting many lives that have been touched by a singular vessel. The author’s search for Pax’s origins grows out of the inexplicable bond that occurred the moment she found “her boat.” If it can ever be said that someone has found the right boat it surely happened with Kaci and Pax. These two came within hailing distance of each other at a time when everything was just right for the meeting. It is strange how many people born far from the ocean are drawn to it by fate. Kaci was an Oklahoma girl more familiar with the rocking gait of a horse than the rolling deck of a sailboat, From her first step on board a yacht she found a similarity in the two motions that would lead her to sail around the world. She came ashore but stayed close to the sailing life as the director of the annual Wooden Boat Festival in Port Townsend, Washington. As such she involved herself with a gathering of finely crafted vessels and a community of dedicated sailors committed to preserving a timeless example of human endeavor. Her involvement would deepen one August day with a simple email message about a boat that was for sale. It was a Danish spidsgatter. A 28 foot long double ended sloop with a tall rig and lines that any sailor can fall in love with instantly. As the story unfolds Pax, built in 1936, had a checkered past much of it shrouded in mystery. A busy person can have a hard time fitting the needs of a wooden vessel into their lives. The varnish and paint alone are enough to defeat many people. When the boat comes along with a raft of mysteries that cry out to be solved the effort is likely to be overwhelming. The best caretakers of boats with an important history are those who have been tested by the sea and the vagaries of life practiced within the full on press of the human condition. Such a person has made peace with a few demons and learned the value of taking life one day at a time. A little perspective goes a long way. Port Townsend is the West Coast mecca for wooden boats and at the very heart of the scene is The Wooden boat Festival. From the moment she bought Pax Kaci had a project that would stretch the limits of her resources. 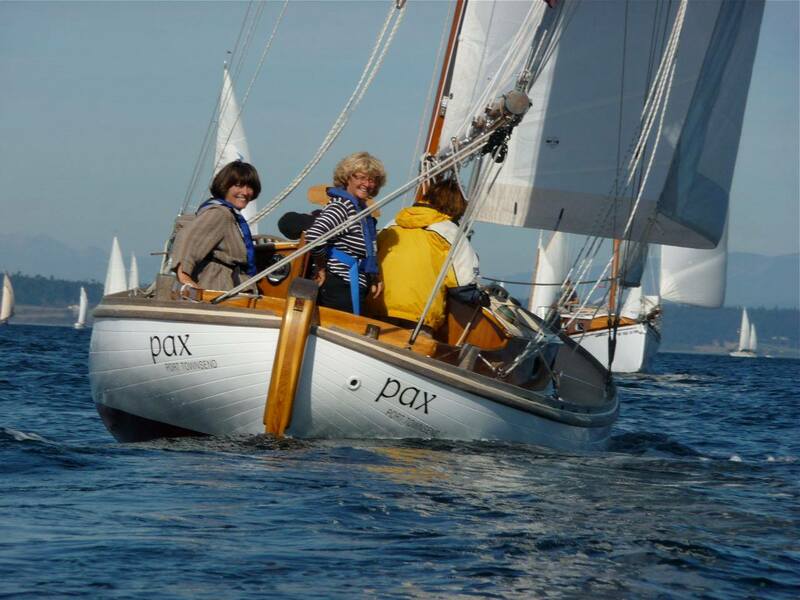 She makes it clear that she had the valuable assistance of many fine people from Port Townsend shipwrights and sailmakers to former owners in this country and folks in Denmark who knew Pax’s builders and designers or were interested in the preservation of these beautiful vessels. As the book progresses you see a marvelous community form around this boat. It seems that Kaci did not buy a boat so much as she grew a family. The story adds these people in layers that give it a unique texture. Anyone who has spent time around wooden boats and the operations that build and maintain them is familiar with the array of diverse characters that inhabit the scene. The boats themselves require a certain temperament and a respect for good materials and hard work. It is a calling and a special way of life. The former owners and builders that were a part of Pax’s history flow in an irregular rhythm that is like a song waiting to be written. Discovery follows discovery From Washington to California, British Columbia, Oklahoma, Denmark and back again. The line up of previous owners take the reader through good times and bad, in war and peace. Through it all every soul that was touched by this beautiful boat was sorry to let her go but joyful in reconnection. It is fitting that there would be a connection manifested in cedar and oak between this community of craftsmen in the heart of modern America and Denmark’s ancient coast. A land of preserved tradition produced a jewel of a vessel that found it’s way to a place where that same tradition is actively being rediscovered. 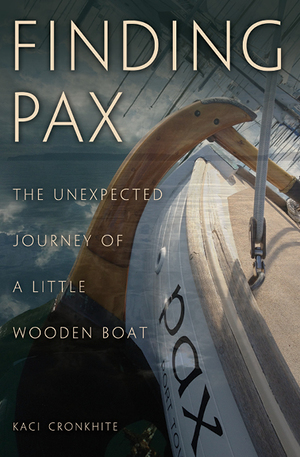 Because of the stories of boats like Pax we are all richer for it. This entry was posted in Designs, Events, Uncategorized, voyages and tagged boat, boat-building, Cronkhite, danish, Finding Pax, Kaci, Port Townsend, sailboat, sailing, sailor, spidsgatter, watercraft, wind spur books, Wooden Boat Festival, Woodenboat. Bookmark the permalink.